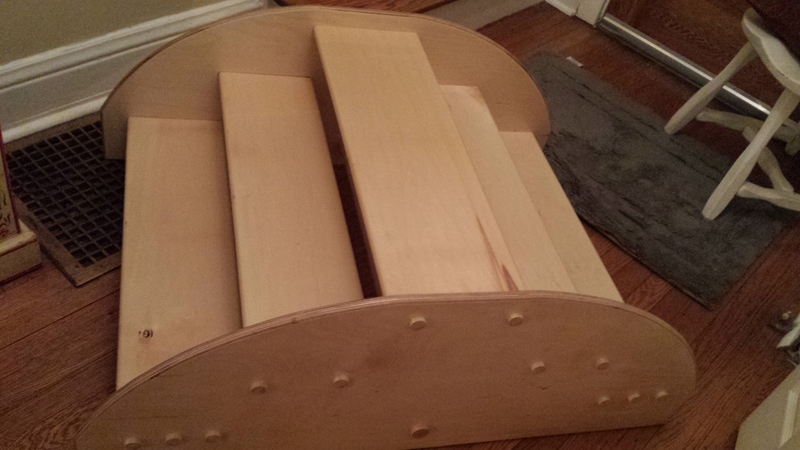 I commissioned SEVEN new pieces of furniture for my parent-infant class and, boy, was I nervous! The woodworker I’ve been working with for quite a while is getting on in years and it was time to give him a break from my frequent phone calls. He is a retired head of the Chicago Stock Exchange and has a workshop in his basement in Winnetka. This wasn’t a full time gig – just something fun to do on the side and after retirement (that’s how long we’ve been together). But things were taking longer, getting a little clunkier and frankly his heart wasn’t in it any more. Or maybe it was his eyes. I’ll miss him though! Anyway, enter new master craftsman. I met this guy in my neighborhood and I was impressed with his work. I asked him to do a weaning table and chair to start but I happened to mention some of the things I wanted “someday” and “down the line.” Well, somehow he talked me into doing it all at once (I still don’t know how) and then I got really freaked out. What if they were all terrible and I hated them? How would I get out of this? No worries! The pieces he did were fabulous. And I gave him so little direction. Honestly, I sent him some videos and told him to “go to second 57 and look at the stair type thing” or I showed him a PLASTIC version of what I wanted in a catalog. I mean these were no clearly designed architectural rendering. But he exceeded all my expectations and I couldn’t be happier! Here are some pictures although the COOLEST PIECE of all he is making a slight adjustment to and will be here next week. 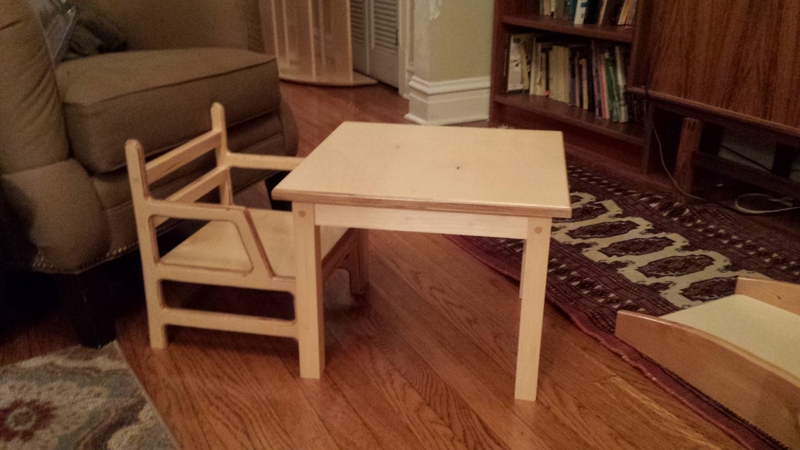 Weaning Table and Chair with metal plate on bottom of each piece replaces a high chair. $250.00 for the set. This entry was posted in R.I.E. and tagged Materials, RIE Babies. Bookmark the permalink. 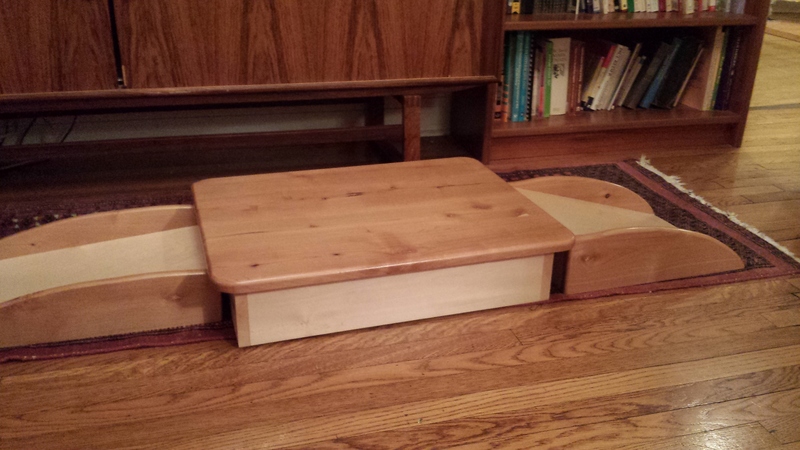 Is the craftsman who created this furniture interested in more commisisions? I’d love his contact information if he is. Hi, unfortunately, I can’t recommend this carpenter for a variety of reasons but have someone new who’s even better. I can send you contact info to your email. Thanks!